Every once in a while you know something is going to be good, just because. This is how I feel about the burgeoning craft cocktail scene happening right here, right now, in NC. At the top of this list is the new vodka called Method & Standard. Crafted by Piedmont Distilleries, (who was first on the scene of the locally made liquor movement), this smooth vodka in its beautiful packaging did not disappoint. And yes, aside from the smooth vodka inside, the bottles and packaging give it the look of an artful and expensive perfume. It is edgy, creative, and good. For the purists, the original vodka will most likely be your preference. 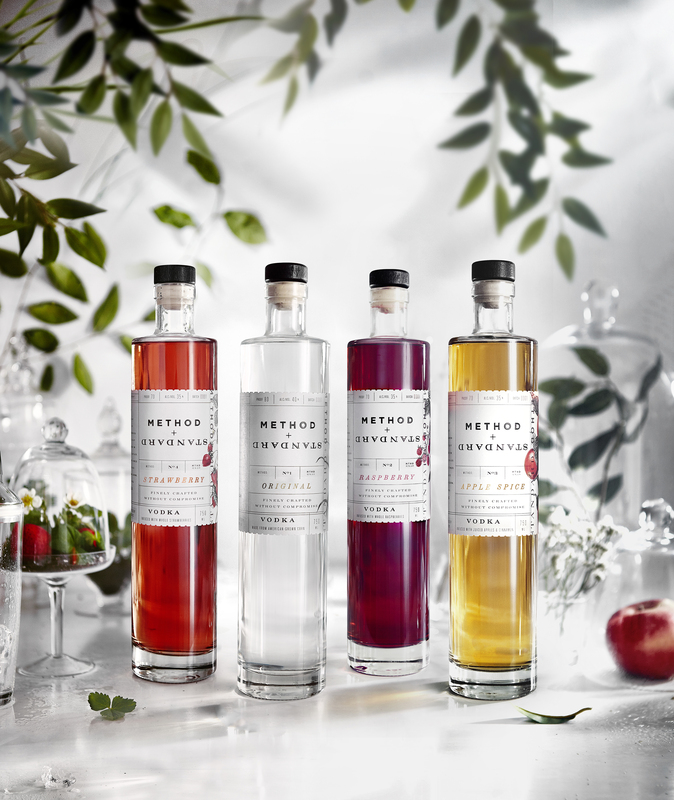 For those of you who enjoy a flavored vodka, you will be thrilled to know Method & Standard also makes Raspberry, Apple Spice, and Strawberry. A fine touch is the recipes they provide with creative cocktails, such as the “Bark & Bite” with apple spice vodka and ginger beer. But don’t take my word for it, you really should get crafty with a bottle of your own. So get by your local red dot store and pick up some Method & Standard today. It will inspire you, whether mixed with soda or tonic and a lime, or created like a NYC mixologist into a premium cocktail of your own. Enjoy! pressing issues…taste of fall, in the South, in a glass. Let’s get to the core of the matter here, we’re talking about apples. It’s October and they are plentiful. Fuji, Staymen, Rome, Winesap, Jonagold, Gala, Red Delicious, Mutsu. Sounds like the fruit version of “Fifty Shades of Apples”. 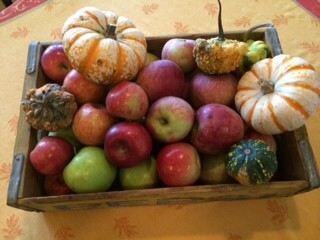 After a beautiful Fall weekend in the NC/Virginia Mountains, I simply have apple on my mind. We spent a fabulous morning in the orchards, and to rest my feet I sat by the fire in the afternoon and caught up on some of my magazines. Garden & Gun has become one of my favorites, and while drooling over half the contents I happened upon a recipe for apple cider cinnamon syrup. Can you say meant to be? The recipe was given as part of a bigger recipe, one for a cocktail called a Sir Isaac Newton, made with apple brandy. It sounds really good, but I can’t stop thinking about how the apple cider syrup might taste with one of my local favorites by Piedmont Distilleries, Cat Daddy, a spiced moonshine. Well, I was so curious that I sampled it. If you think spiced moonshine, sweet with the syrup and tangy with lemon is an enticing combination, give it a shake. Sweet enough as an after dinner drink, and a good pre-dinner sipper as well. For anyone wanting some different non-alcoholic options, I also have some fresh hibiscus flowers, and I think a cinnamon apple hibiscus tea sounds pretty enticing on a chilly morning, too. Any who…the apple cider cinnamon syrup is a breeze to make, it really is just a matter of reducing the cider and adding cinnamon. Watch it carefully though, this would be a sticky mess even a brillo pad would shy away from if it started to burn. The recipe follows, but naturally I had to adjust because I thought it sounded like it made more than I needed…and I am out of cinnamon sticks. So, I added a dash of ground cinnamon to one cup of cider, and the results yielded a little over 1 ounce of great syrup. The perfect amount for a drink later on tonight. Pressing issues, the demands of the daily grind, all the curve balls life can throw our way. Stop, enjoy, relish the moment of the season, and right now that is apple season, southern comfort in a glass. Enjoy, the best of food and life! 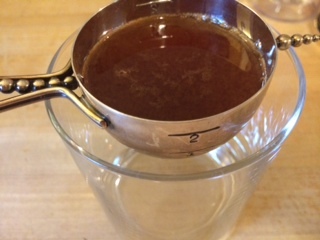 To make apple cider-cinnamon syrup, bring 4 cups of good quality apple cider to a boil over medium heat. Reduce the heat to medium-low, add a cinnamon stick, and continue to cook, stirring occasionally, for about 25 minutes, or until the cider has reduced to the consistency of syrup. Bring to room temperature, then refrigerate in a tightly covered container. This yeidls about 4 ounces. 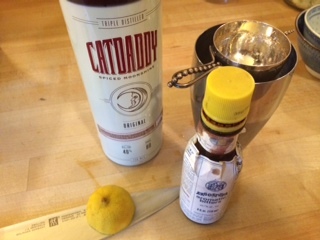 Combine the syrup, lemon juice, Cat Daddy and bitters over ice in a cocktail shaker. Shake vigorously, then pour with ice into a highball glass or mason jar, preferably chilled. 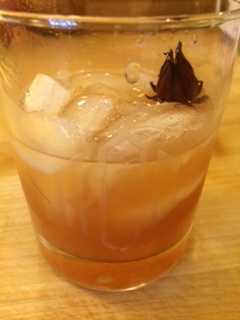 Garnish with lemon twist, or, as I happened to have fresh hibiscus flowers I used that. Combine the syrup, lemon juice, brandy, and bitters in a cocktail shaker with ice. Shake vigorously, then strain into a chilled cocktail glass. Float the apple slice on the drink for a garnish, and serve. It has come to my attention that in the few posts I have done through Moose Mixology, as well as my regular blog posts, I mention muddling a lot. It has also been pointed out to me that I might be muddling the minds of some readers who aren’t sure what this technique is all about. So allow me to elaborate on this simple concept that might make you feel like a professional bartender. Even if muddling doesn’t take you to the Tom Cruise tossing bottles over your shoulder level, it will at least turn a plain Vodka tonic into a Raspberry & Herb infused Vodka Tonic, if nothing else. Your cocktail hour might never be the same. Muddling a drink simply means smashing an ingredient to extract the flavor, and or color. For the sake of this simple explanation, let’s use mint as our ingredient. You place the mint in the bottom of a thick glass and use a muddler to bruise it, to really smash it up and release the oils and flavor of the mint. You will smell it, and if someone walks into the room and smells it too, you will know you have done it enough to move on to the next step in your cocktail. Some of you are probably wondering what does a muddler even look like? A traditional muddler looks like a wooden stick, a small baseball bat to be honest. Commonly made of wood, one end is skinnier than the other end, and the larger end usually has a rounded area. The larger round end you use to smash ingredients in the bottom of your glass, the skinny end can be used for stirring. When you smash an ingredient like mint, you are releasing the flavor of the oils into the glass. When you muddle a berry, such as a raspberry, you release little pods of flavor, and color. 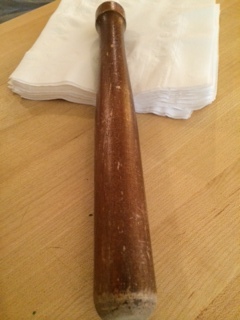 Some muddlers are more modern and sleek, and some muddlers have teeth that can be used for heavier or bulky ingredients, such as berries. While it can be fun to have different types once you really get into it, it is not necessary. You can muddle your drinks with a wooden kitchen spoon if you need, or want to! Depending on my ingredients, I will sometimes strain my cocktail before pouring into a glass to enjoy. This will be your choice, and will largely be based on the content of what you are muddling. Think of a mojito, one of the most popular muddled drinks, you often are served a mojito with the mint all throughout the glass, and sometimes it is strained and the mint then used as a garnish. Personal preference, time and the number of cocktails you have made and enjoyed already will most often dictate what you do. Most importantly, muddling allows you to play, to get creative in the kitchen, to use what you have in your garden or what you bought at the farmers market and aren’t sure what to do with! Yes, there are lots of recipes out there to research and try, but make up your own drinks and have fun….I love doing this! The other week I made the most fabulous Muddled Mulberry Margarita, super simple. Using fresh mulberries my kids had picked at their grandmother’s, I muddled the berries with lime in a glass, making a lime mulberry syrup. (See how simple that is, just sounds like it took a lot of time.) I juiced two whole limes into that, then added tequila and triple sec at their proper proportions. Because of the seeds in the mulberries, I did strain this mixture into a shaker, then mixed up one of the most clean and delicious tasting cocktails I’ve enjoyed in a while. It wasn’t the maker, but the fresh, local flavors that allowed me to indulge, to sip, to savor the best of food and life in my glass. For those of you who want a little hand holding, click on this link for a Mojito or Raspberry Smash recipe, or this link for a Hudson Lemonade or Black & Blue. As with anything these days, there are limitless numbers of recipes out there just a click away. Once upon a time cocktails were clean and simple, and mixologists were something you found in a lab and not a bar. But in the mixology world, muddling has become quite the trend in the past couple of years. So don’t muddle a rebuttal, try it tonight! You might be reading this post through my blog, or perhaps through the collaboration with Dashing Through Winston-Salem, a fun blog by my friend Christine Storch. Either way, I thought the timing for this edition of Moose Mixology was very timely for the 4th of July week and a fabulous summer of 2014. Enjoy quenching your thirst! I find there is a lot of truth in the old adage ‘you can’t beat the classics’. After all, classics become classics for a reason. So it is with many recipes and drinks, and todays featured classic is good old fashioned lemonade, a taste of summer in a glass. So forget the powders, cartons of minute maid, or whatever it is you have bought recently at the store and give this a try. So simple, so pure, and in my opinion the perfect thirst quencher for summer. The recipe below is simple, non-alcoholic lemonade, so a great thing for you and the kiddo’s to do together. My kids new discovery is an Arnold Palmer, half tea and half lemonade, they think they are so cool. However, the library of mixology options for homemade lemonade is mind blowing! If you could see my mind reeling with all of the pairing options for this lemonade- you might get dizzy. 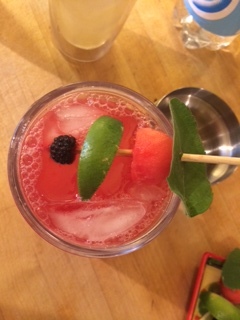 Be sure to check out a few of my favorite summer cocktails below the recipe, for those of you wanting to change up your summer cocktail hour in a refreshing new light. 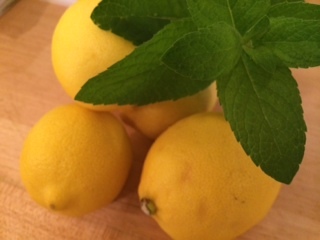 Enjoy the best of food and life, and make lemonade when life hands you lemons! Bring 1/2 cup water to a boil in a medium saucepan. Stir in sugar and grated lemon rind, stirring until sugar is dissolved. Remove from heat. Stir in lemon juice and water. **To make limeade substitute limes for lemons. I do orange-ade in a similar way, and if I don’t have enough of one I mix them all together. You can get creative and add fresh herbs or mint, too! ~Mix lemonade with nice bourbon and splash of soda…garnish with lemon and or orange slices, serve in fun old fashioned glasses with large ice cubes, the kind grandma used to have. ~and for you Firefly Sweet Tea Vodka drinkers, real lemonade is a game changer. Enjoy summer, one sweet glass at a time! Saint Patrick’s Day is Monday and a lot of people are seeing green. In our house we enjoy a slow simmered corned beef brisket and potatoes, after a morning of leprechaun traps and searching for rainbows by the wee ones. Leprechauns are messy, but I do hope one day we find them with a pot o’ gold. I think it’s interesting how so many people without Irish heritage celebrate this green holiday, don’t you? I am not into the green beer type of thing, nor Irish Whiskey for that matter, but it made me wonder what Irish Whiskey really is. Last week a friend brought me a bottle of rye whiskey as a gift, and then it really had my wheels turning and caused me to really look into the science behind whiskey. Here is what I learned. In a nutshell, whiskey is any booze distilled from fermented grain mash and must be 40% alcohol by volume. The differences in whiskey relies on the type of grain used. For example, Scotch is whiskey made from malted barley and bourbon is whiskey at least 51% corn. Things go much deeper than this, and where the whiskey is made has a lot to do with it as well, such as Tennessee Whiskey and the aforementioned Irish Whiskey. For those of you interested you can click here to go to a website that will give you much more information, but for now that is about as scientific as I’ll get on this post. If you’re like me, it is always nice to have what we call “kid friendly” drinks for fun days like this. Mom and dad can have their adult beverages, and the kids have fun as well! So today I am sharing with you a green recipe that is truly so delicious I’ll have it, too. It has been something we have made in our family for generations, particularly at Holidays and family reunions, basically anytime where young and old have gathered to celebrate over food and family. I simply call it “Grandma’s Family Reunion Punch”, and I hope it might inspire you this St. Patrick’s Day, or any other time as well. Dissolve kool aid, sugar and water in large container. Add the ginger ale and sherbert just before serving, stirring in. Serve and enjoy! 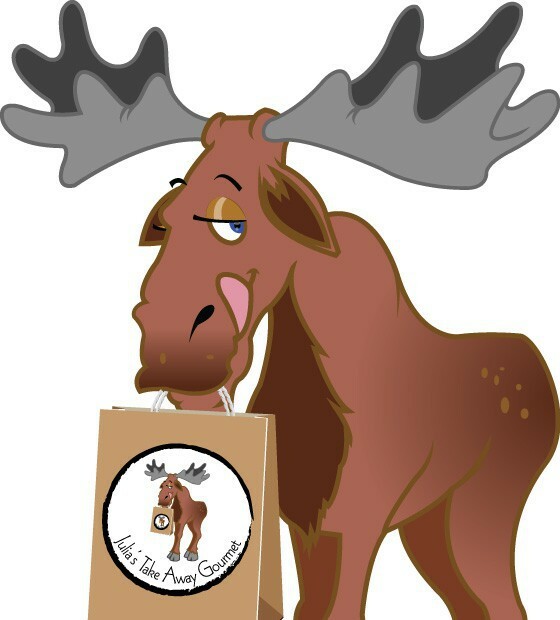 Moose Mixology- a “glass is half full” approach to life! This morning my dear friend Christine Storch shared the post below on her blog, “Dashing Through Winston- Salem“. If you don’t follow her blog, please check it out, it has great stories about life, food, fashion and more happening in our city we affectionately refer to as “the Dash”. Every couple of weeks Christine and I will be collaborating to bring our readers some fun drinks, often cocktails but also some great ideas for kids and more! I might cover a hot new bar in town or something related, so please keep reading, and enjoy! 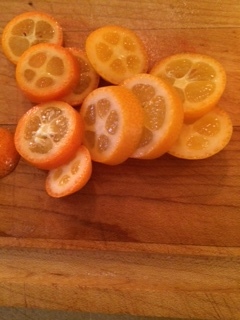 Let me introduce you to a small little treat, key word here small, called kumquats. Yes kumquats, a little fruit you have probably heard of but might not know much about. They look like a tiny orange and taste like a bitter orange, sweet at first bite and then sour inside. Nature’s version of a sour patch kid if you will. Click here to learn more details about these jewels which are in season primarily in the Winter months. So, if you know me, I am always looking for fun new culinary adventures and a trip to Trader Joe’s the other week ended with kumquats in my grocery cart, lost amid other fruits and cheeses. I recalled reading a recipe in the Lee Brothers Charleston Kitchen cookbook for a cocktail using kumquats, so it was straight home to research and then to work. The result, a delicious infused gin that works magic in a glass over ice with club soda. Go on, find some kumquats and mix it up today! This yields a fabulously floral infused gin with such minimal effort I almost felt bad over how yummy it tasted. My “Mister Mixology” is strictly a bourbon drinker, but he did dip his finger in the jar and even he thought it was good. I hope you find the simple steps below delicious and easy, too. 1. 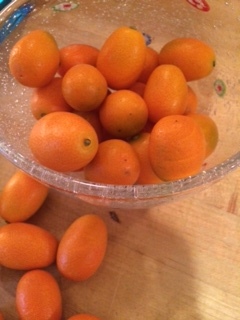 In a pint Mason jar or other non-absorbent container, place about one cup of thinly sliced kumquats as pictured above in the bottom of jar. As you slice you will need to remove the seeds, but no worries, it was an easy task to do as you go. 2. Because I had fresh thyme to use up, I added 3-4 sprigs on top of the sliced fruit. Gin, by nature, is herbaceous and I think the combination worked well. You could leave it out entirely, or substitute other fresh herbs such as rosemary or basil. Play around, but the mild infusion of thyme was pretty darn good, not sure it could be beat! 3. 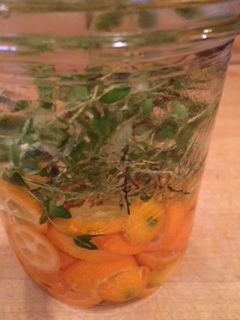 Pour gin to cover the kumquats and herbs to the top of jar. 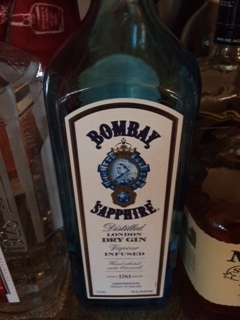 I used Bombay Sapphire, as it is what I had the most of, but use what you enjoy drinking, it will be wonderfully enhanced with flavor after this. 4. Carefully place the lid on the jar, and set aside for 2-3 days for the flavors to infuse, just on your counter at room temperature. It’s fun to show off to friends, it’s really pretty in the jar, just don’t shake it up much! 5. I poured my Kumquat & Thyme infused Gin over ice and topped with a splash of club soda. It didn’t need a lime in my opinion due to the citrus of the kumquats, but if I had been serving it to guests I definitely would have fancied it up by garnishing with a sprig of fresh thyme and a slice of kumquat on the rim. But get jiggy with however you want to mix your drink…and share the love, please, let us know what you concoct as well!